Infrared/optical image of the RCW 49 HII region - a massive star formation region about 300-400 light years across - and the Westerlund 2 stellar cluster. Westerlund 2 contains a number of Wolf-Rayet stars, among them WR 20b and WR 20a, a binary system of two 70-solar-mass Wolf-Rayet stars in a tight orbit. The image shows a region of about 10' by 10'. Image provided by Elysandra Figueredo (CTIO). RCW 49 is a giant HII region - a cloud of ionized hydrogen - located towards the outer edge of the Carina arm of our Milky Way, at a distance of maybe 4-6 kpc. 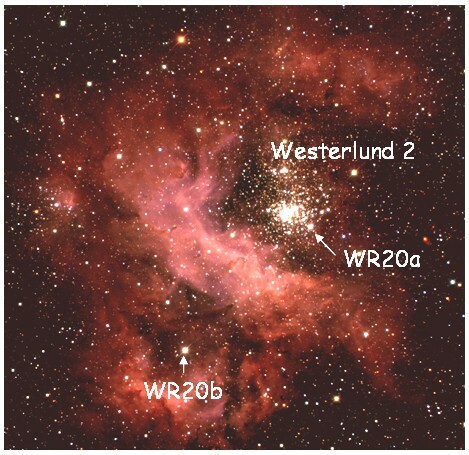 Embedded in RCW 49 is the open stellar cluster Westerlund 2. The region, with massive star formation, has been extensively studied at various wavebands, and is also an interesting target for gamma-ray observations. Chandra observations uncovered about 500 X-ray sources in the region (Townsley et al. 2004). A number of massive Wolf-Rayet stars have been found in RCW 49, among them WR 20a and WR 20b (Van der Hucht 2001,Shara et al. 1991). In 2004, WR 20a was recognized as a binary system of two Wolf-Rayet stars, with an orbital period of 3.7 days (Rauw et al. 2004,Bonanos et al. 2004,Rauw et al. 2005), and minimum masses of about 70 solar masses for each of the stars. WR20a is the most massive binary system known in our Galaxy. The massive hot Wolf-Rayet stars generate strong stellar winds, and stellar wind-blown bubbles around WR 20a (and the core of Westerlund 2) and around WR20b are clearly visible in infrared (Churchwell et al. 2004) and radio images (Whiteoak & Uchida 1997) of the region . Integrated over their lifetime, the wind energy output of Wolf-Rayet stars - some 1037 ergs/s - is not so far from the kinetic energy released in supernova explosions, and shocked winds are well suited to accelerate particles to high energy. This applies in particular to the region in between the two Wolf-Rayet stars in WR 20a, where their winds collide with relative speeds of order 1000 km/s. Massive binary systems are therefore likely sources of high-energy gamma rays, produced either by inverse-Compton scattering of accelerated electrons, or by acceleration of nuclei followed by collisions with ambient material and gamma-ray production via the decay of pions created in the collision (seeReimer, Pohl und Reimer 2006 and refs. given there, andBednarek 2005). The RCW 49 region was target of H.E.S.S. 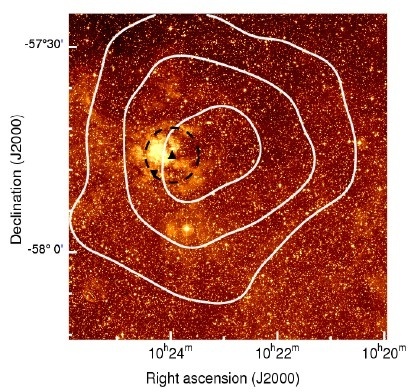 observations in March through July 2006, also as part of the survey of the Galactic plane; about 13 h of good-quality data were obtained. In the vicinity of WR20a, a clear excess of VHE gamma rays is visible, see Fig. 1. The significance of the excess is about 9 standard deviations. Compared to the point spread function of the instrument, the source - termed HESS J1023–575 - appears slightly extended, corresponding to an intrinsic size of the gamma-ray source of about 0.2 degr. ; its center (black point in Fig. 1) is slightly shifted compared to WR 20a and to the Westerlund 2 cluster. As expected for an extended source, the gamma-ray flux is steady over time. Fig. 2 and Fig. 3 show the gamma-ray source in relation to optical (B-band) and radio (843 MHz) images, respectively. What is the origin of these gamma rays? With a projected angular size of milliarcsecond scale, the WR 20a binary system, including its colliding wind zone, would appear as a point source for observations with the H.E.S.S. telescope array. 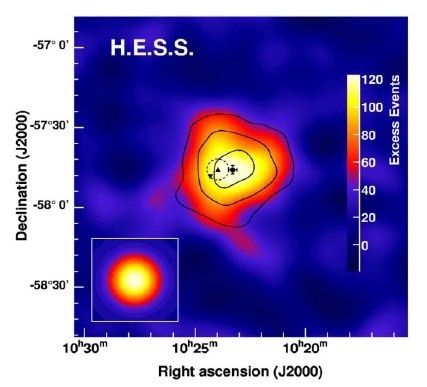 Unless there are extreme differences in the spatial extent of the particle distributions producing radio, X-ray, and VHE gamma-ray emission, scenarios based on the colliding stellar winds in the WR 20a binary system face the severe problem of accounting for a source extension of 0.2 degr. in the VHE waveband. 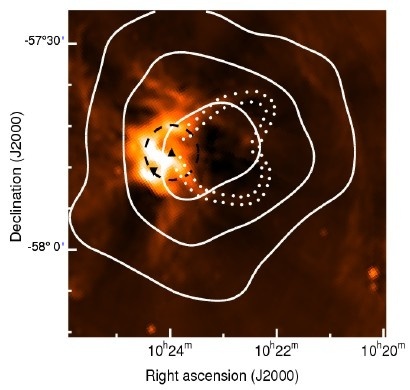 At the nominal distance of WR 20a of 5.75 kpc, this source extension is equivalent to a diameter of about 20 pc for the emission region, consistent in size with theoretical predictions of bubbles blown from massive stars into the interstellar medium (Castor et al. 1975). Shocks and turbulent motion inside a bubblecan efficiently transfer energy to cosmic rays, providing a plausible mechanism for particle acceleration. In size and location, the gamma-rays source resembles the "blister" (Whiteoak & Uchida 1997) on the western side of Westerlund 2, where the bubble opens up and the wind expands into a low-density medium. Shock acceleration at the boundaries of the blister may enable particles to diffusively re-enter into the dense medium again, thereby interacting in hadronic collisions and producing γ-rays. Similar scenarios were outlined byVölk (1983) for a supernova-driven expansion of particles into a low density medium. If one accepts such a scenario here, it might give the first observational support of gamma-ray emission due to diffusive shock acceleration from supersonic winds in a wind-blown bubble created by WR 20a, or by the ensemble of hot and massive OB stars in Westerlund 2.